What is it with wearing leggings and feeling healthier? Sometimes I put them on with the intention of working out, but I don't end up at the gym at all, and for some reason mentally I feel like I am totally more fit. I cannot be the only one. These eggs are super easy to make and I promise they'll blow your neighbors plain ol' dyed eggs out of the water. Scroll down for the tutorial. 1. Hollow out or hard boil several eggs. Allow to cool. 2. Paint the eggs red, allowing each side to dry before painting the next. I found that using the egg container to allow the eggs to dry in between worked well. 3. Once dry, use a black Sharpie to draw small black dash marks down the egg. Allow to dry. 4. 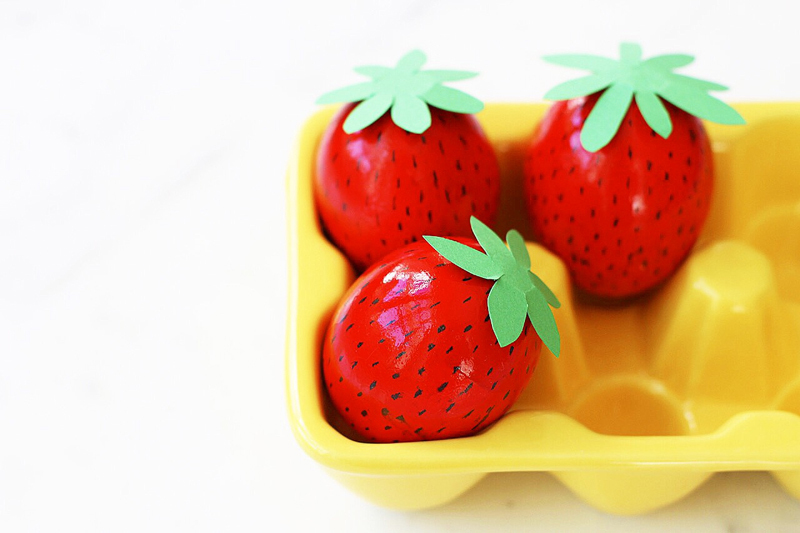 Cut randomly shaped strawberry toppers out of your green construction paper and attach to the top of your strawberry egg with a dab of glue.